published on the “e4 e5” magazine. All participants will receive the award by e-mail. 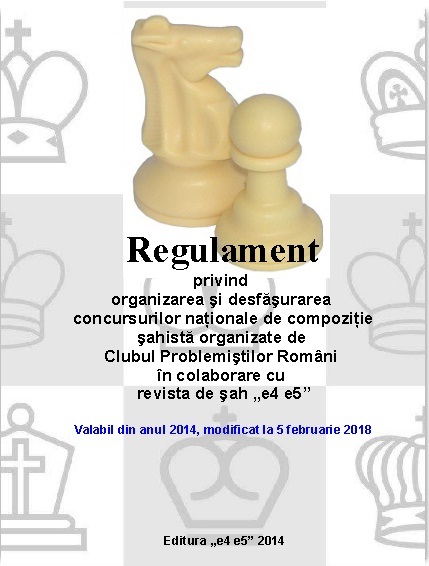 Celebrating a century since Bukovina got united with the country, the Romanian Problemists Club in collaboration with the "e4 e5" Supplement, organises an informal chess composition tourney with a free theme. We ask for special composition problems that include the Mosaic thematic pieces. The unlimited number of problems can be send at the magazine editorial address or to the following email: www_chessplayer.ro@yahoo.com. The period of receiving them is due 25th of December 2018 and all the participants will receive the printed magazine. Informal composing tourney, free theme. Zero-positions, fairy pieces and/or fairy conditions are not allowed. Unlimited entries. Judge: Valerio Agostini (Italy). allowed. Unlimited entries, send originals to e-mail www_chessplayer_ro@yahoo.com before December 25, 2018. Awards will be published on the „e4 e5” magazine. Correspondents will be sent the printed magazine. Please reprint! of "e4 e5" Dan Gurgui www_chessplayer_ro@yahoo.com. Closing date: December 25, 2018. In 2018 all participants will receive the magazine printed in A5 format. B 2018 году все участники получат журнал, напечатанный в формате A5. Send me your problem for "e4 e5" and "Buletin Problemistic"
Regulament de organizare si desfășurare a concursurilor de compoziție organizate de C.P.R.